ENCOURAGE DYNAMIC STANDING. GIVE MORE COMFORT TO YOUR FEET. An anti-fatigue standing mat designed to support you at a standing desk throughout your busy executive day. 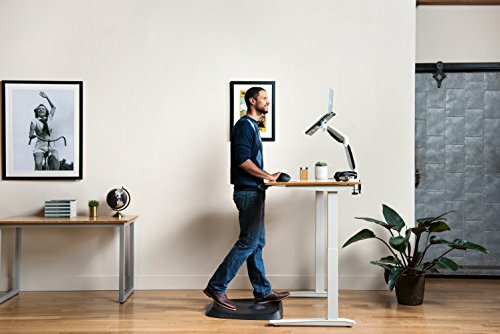 With more built-in features, such as massage mounds, support track, balance bar and power wedge, the Ergodriven Anti-Fatigue mat relieves the pressure and burden from standing all day at your standing desk, without incurring fatigue or aching legs and feet. The mat allows you to easily transit from seating to standing in just one-foot position. Made from highly durable materials, giving more comfort for your feet and legs. 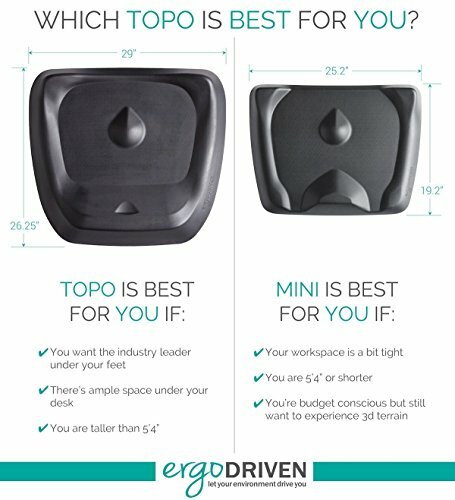 Two models: Topo and Topo Mini. The Topo mini is designed for smaller spaces, smaller users and smaller budgets. This mat promotes movement through the work day, decreasing the fatigue associated with lack of movement. Exercise without thinking through yoga-like movements and stretches. Enhance use of a stand-up desks by targeting muscle groups that are ignored by seated desks. Movement is proven to be important to allow sufficient blood circulation through the muscles. The contoured mat has been proven to provide 2.37 more movements per minute and 202% more ground coverage per foot, than a normal flat mat. If you like working at multiple stations around your desk, a flat mat could be a better option for you. Experience natural movement as you work today!